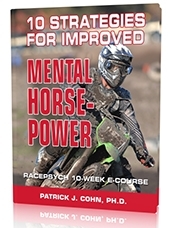 Racing Psychology expert, Dr. Patrick Cohn, at racingpsychology.com helps NASCAR, Motocross, and motorcycle racers improve performance and lap times by boosting racing confidence, focus, and mental preparation on race day. Learn motocross and auto racing techniques to improve performance on the racetrack. In today’s mental training session for BMX racers, I discuss how to use mental imagery before races. 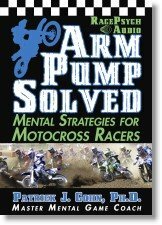 Learn the top mental training techniques for auto and motocross racers. Not every racer is a visual learner. Racers have different learning styles, seeing, feeling or hearing. The most common type of imagery is seeing, or visualizing. You may be a kinesthetic learner, or learn by feeling yourself on the racetrack. To mentally prepare for a race, you should do “mental laps” or see, feel or hear yourself go around the racetrack. Most racers are a combination of visual and kinesthetic learners. The best way to use mental imagery is to find out which learning style works best for you. You should see or feel yourself just as you are performing, in real time. Listen to this podcast on “mental imagery” to learn mental game tips to prepare yourself for race!